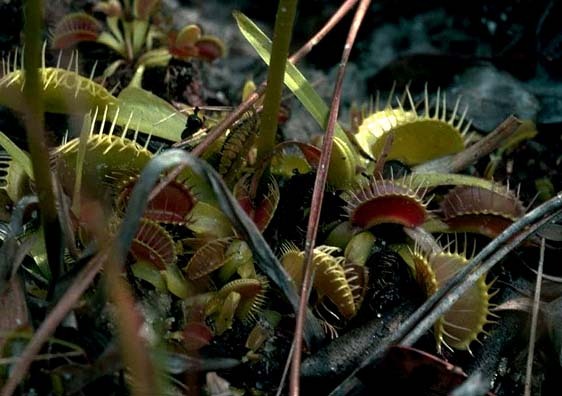 The Venus flytrap is native to Carolinas but is found growing between Florida and North Carolina. They usually grow in mesophytic conditions. Therefore they are usually found near or in bogs and marshes. The Venus flytrap reproduces through pollination like any other plant. During the spring, the Venus flytrap produces a very long, thick stem from the center of the rosette. The stem contains flowers that are small and white. These flowers will die off after a short time period (few days). The stem itself continues to grow on for an extended period of time. However, the stem can be cut off at the base once flowering has stopped. The closed heads will produce seeds when pollinated. Interestingly these heads are located away from the main specimen. This is to promote insect pollination. If the stalks were near the specimen the insect would run the risk of being eaten before pollination could occurred.